No evidence of vote-rigging has been found in the award of the 2006 World Cup, says a report commissioned by the German Football Association (DFB). However, law firm Freshfields adds in the report it cannot "completely rule out" votes being bought as it was unable to speak to all those involved. That includes Sepp Blatter, former president of world governing body Fifa. 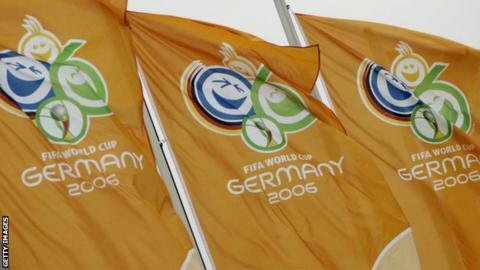 The report was commissioned after it emerged the DFB made a secret payment of 6.7m euros (£4.6m) to Fifa in 2005. Der Spiegel magazine alleges that money was used to buy votes, but the DFB said it was the return of a loan from former Adidas chief Robert Louis-Dreyfus. Sports equipment maker Adidas, a long-time DFB sponsor, said it was unaware of any such payment. Speaking at a news conference, Freshfields' Christian Duve said the payment had been made, but was not intended for the opening ceremony gala as was indicated in documents. The report also identified a payment from then World Cup 2006 organising chief Franz Beckenbauer via a Swiss bank account to scaffolding company Kemco in Qatar, the owner of which was disgraced ex-Fifa official Mohamed Bin Hammam. "They landed somewhere in Qatar, this is under the influence of Bin Hammam. But anything beyond that is speculation. We had the task of presenting the facts," said Duve, who added some documents were missing from DFB headquarters. Blatter, 79, is suspended from football over a separate, wide-reaching corruption scandal but denies any wrongdoing. Fifa said it would study Duve's report carefully and incorporate the results into its own investigation.